You will love it! It is life changing! I did all that in December at AM solar....top of the line. Enjoy! Great pics. That kind of an upgrade is on the list and I have bugged Lew a few times. Wish they were closer to Texas. Keep the pics coming. Just got back from Naples with 400 w solar panels and 400 aH Lithium. Great work by Lew and Michael. I'm curious how he wired it up to allow for the engine alternator charging. That's what has me a bit worried when installing 400amp or higher load batteries. Lots of different ways it can be done. The line item they are installing is a "Victron Cyrix-Li-ct 12/24V-230A Intelligent Li-ion battery cmb", which is just a chassis battery boost I think. I'm not sure of anything else but I know they are doing something as there is about 6 hours of labor. I told them I definitely want the plumbing for the second alternator so it might be some of that. I'm considering adding a Nations second alternator for the house but it's not cheap with install. They tell me the factory alternator will bring me up to about 80% state-of-charge and the overall solar will help top that up a bit (I travel in the south primarily). The 2nd alternator is probably my next upgrade but for now I will see how the factory alternator performs. I opted for more aH of lithium over the alternator to give me a bigger base of power and I plan on plugging in every 3-7 days. 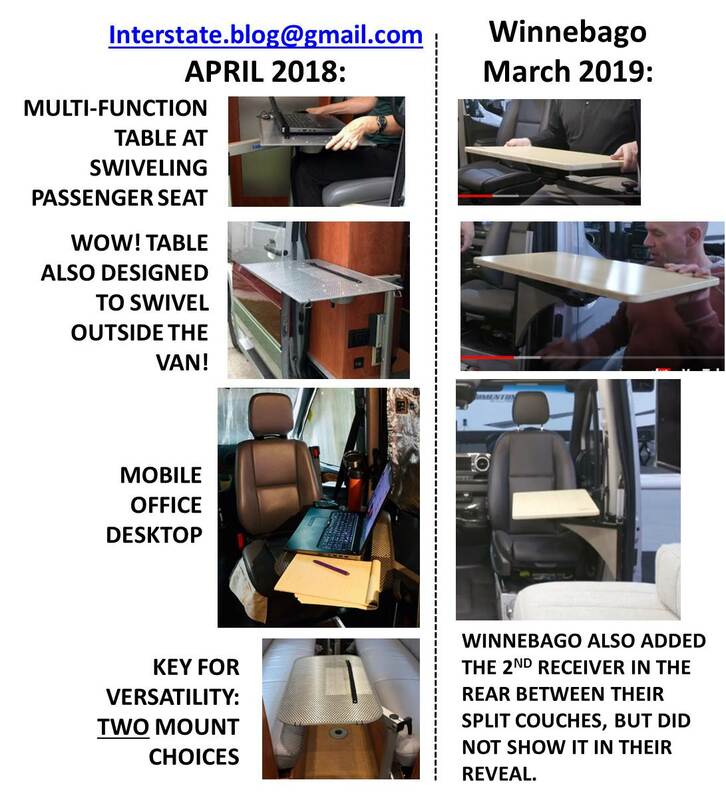 Check out that magnificent new table system that Winnebago has revealed - such innovative thinking!! Not just the same old clunky floor-pedestal table design, but an actual ergonomic thought process involving two receivers (front and rear) and both indoor and outdoor capability! Seems like you have the W as fans and subscribers of your blog. Where is your royalties on helping them with their design choices? InterBlog, your mounting solution is still more elegant and better executed, imho. LOL thank you, I thought so too, but I having a rare moment in which I was feeling graceful and so I did not say that. I was hoping that Airstream would put the Truma in the new AIs since they did that in the AI19. My sources tell me that the Truma is in the AI19 was only because of the limited interior space and won't be going into the 2020 AI. The upgrade from the Suburban (?) furnace and gas water heaters would cost Airstream about $1,000 per van. Apparently they don't think that buyers will pay more for the added storage space and a more efficient and comfortable heat/water system. Winnebago's Boldt is a bet that we will. Hope Airstream goes with Truma. The huge box under the back seat is really unnecessary. Temperatures would be more consistent when heat is on. The Truma saves a few holes in the side of the van too. I've been giving a lot of thought on installing a Truma Combi where the existing water heater is. I actually think it's do-able. There is plenty of room to install a Truma Combi in another place and you can free up the storage space where your current water heater is located. At the January Tampa RV Show I removed the vent that's thumbscrewed in under the refrigerator on a 2019 AI GT and it would fit there. Then you could also remove your Suburban gas furnace and put in a huge drawer. That would leave several holes in the side of the van that could be closed by an auto body shop. The concentric air inlet/exhaust on the Truma Combi are typical German engineering perfection. Issues with sound and air circulation issues caused by the Suburban RV Furnace could make this a worthwhile upgrade. The Truma Combi's 4 flexible heat ducts to tiny outlets located your van will take care of any cold spots.